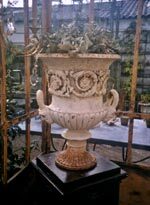 A rare Bronze urn, of semi-lobed campana form, with mask and loop handles and applied frieze of scrolling foliage centered with flower heads, on rising fluted circular foot and square base inscribed. Sir J.H. Thorhold of Syston House, Lincolnshire, married his second wife Mary Ann on the 12th July 1830. It is likely that this vase was specially commissioned to commemorate the occasion. Although no Antique prototype is known, this model was extensively produced in cast iron by England and French foundries in the 2nd half of the 19th Century. Lewis Vulliamy was commissioned and built the new Library and other additions at Syston in 1822-1824, which was demolished in 1935.